In 2013, Daniel Rosenthal published The National Theatre Story (Oberon Books), a vast, 850 page tome that provided a comprehensive account of the British institution from its inception, and its move from its Old Vic base to its South Bank home, through the regimes of its first five artistic directors: Laurence Olivier, Peter Hall, Richard Eyre, Trevor Nunn and Nicholas Hytner. 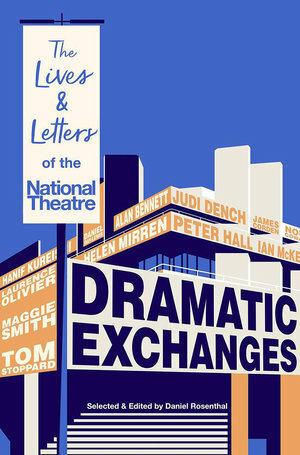 Benefiting from access to the National's extensive archive (including its tantalisingly named "restricted holdings"), Rosenthal also conducted over ten years' worth of interviews with many major National Theatre participants, resulting in a text that put the range of the theatre's work into a wider context than ever before. Despite the book's length, Rosenthal's research for The National Theatre Story obviously yielded more material than he could possibly incorporate. So his new publication, Dramatic Exchanges: Lives and Letters of the National Theatre (Profile Books) offers an alternative history of the National, one presented entirely through epistolary forms: the letters, cards, memos, telegrams, and emails exchanged by actors, directors, designers and other creatives involved in the theatre from the turn of the century to the present. The result is a lively, highly enjoyable collection that nicely complements not only Rosenthal's previous book but also Hall and Eyre's absorbing published diaries and Hytner's less illuminating memoir, Balancing Acts (Jonathan Cape, 2017) (reviewed here on PopMatters). Unlike The National Theatre Story, which really required a cover-to-cover deep read, Dramatic Exchanges is the kind of text that can either be read chronologically or dipped into randomly, and both approaches have their benefits. Except for the opening "Prologue" (which distills the institution's protracted pre-history and features great correspondence from the likes of George Bernard Shaw, who laments that "the English nation ... has just enthusiastically given a huge sum of money to buy the Crystal Palace for the sake of the cup finals, but absolutely refuses to endow a national theatre" [p.5]), Rosenthal takes a year-by-year, Directorship-by-Directorship, production-by-production approach. He prefaces each of the six sections -- styled "Acts" -- with brief but illuminating context-setting, and his editorial interjections are succinct and sometimes witty. Of the controversial "bacchanalia" that concluded Peter Brook's 1968 Oedipus production, for example, Rosenthal explains: "Brook refused to cave in to Olivier's demand that he omit the phallus, which the Director claimed could alienate audiences and the Board" (p.74). Still, the substance of the book lies, of course, in the letters themselves, and the insights that they give into the workings of the theatre and the relationships of the participants -- precisely the stuff that Hytner's memoir was frustratingly evasive about. As relayed through the letters, the development of, and reaction to, seminal productions -- from Amadeus to Angels in America -- is fascinating, as are the contributions from actors either lobbying for work or tactfully turning down unappealing offers. Personalities emerge, sometimes confirming, sometimes contradicting public perceptions. Paul McCartney refuses an offer to write music for Clifford Williams's production of As You Like It by revealing "I don't really like words by Shakespeare" (p.64). "I am a young writer trying hard to get on," opens a 1977 letter from Hanif Kureishi, touchingly as, aged 22, he writes to the theatre with a pitch for an adaptation of Dostoevsky's Notes from Underground (p.146). Elsewhere, Maggie Smith snippily expresses her disappointment at Olivier for giving a role he'd promised her to Geraldine McEwan (p.80), while Judi Dench cheekily petitions David Hare to write her "a musical so that I can sit on a chair in a fur hat & nothing else and sing RUDE songs" (p.229). James Corden, effusive to the point of sycophancy, praises Nicholas Hytner for his "wisdom, friendship and guidance and being a different class to anyone I've ever worked with" (p.338), while Marianne Jean-Baptiste and Rufus Norris banter by email as they negotiate her return to the London stage in his 2013 revival of The Amen Corner (p.349-50). Bearing out Tony Kushner's assessment of the director/playwright relationship as the most difficult one in theatre, much space is given to correspondence between those collaborators: negotiating, compromising, working through disagreements -- or refusing to when egos are bruised. Here we see relationships flourishing or painfully floundering over the years, as when Peter Hall's friendship with Peter Shaffer fractures over the latter's not advocating for Hall as director of the film adaptation of Amadeus, (p.170-172). There's a poignancy to some of the pieces included, such as letters from the public expressing their appreciation for shows that didn't receive their critical due; creatives' reflections on superb productions that didn't get the transfers that they deserved (designer Rae Smith on The Light Princess: "[I]t is a brilliant beautiful unique and exquisite show and I take it v personally that it is not moving forward" [p.352]); and revelations of promising projects that were discussed but never came to be (Emma Thompson as Rosalind in As You Like It [p.249]!). There are surprising cameos, too. Paul Schrader writes to Peter Hall to confess his abandonment of a commission with a mixture of defeatism and bravado ("writing a play is something I can do... a damn sight better than many others currently wearing critical laurels" [p. 200]), while John Osborne's mother Nellie wonderfully chastises the press for her son's bad reviews in a furious telegram: "My dear son how dare these critics pull to pieces such fine work... To me they just smell, I hate them How cruel can these little wee men get" (p.46). The collection also interestingly reveals changes in the tone and content of written communication over the decades, as email makes correspondence shorter and slangier, the fond "Dears" and "Darlings" of earlier years giving way to such greetings as Rufus Norris's excruciating salute to Simon Stephens: "Hi there big man" (p.367). Naturally, there are many gaps in Dramatic Exchanges; no correspondence is included from certain major players and not all of the letters featured feel essential. But the book still manages to cover quite a lot, and a selection of photographs of productions and posters also adds to its aesthetic appeal. Evoking the pleasures and challenges of collaboration, and the precariousness and variables of working in this most social of art forms, Dramatic Exchanges is a delightful, illuminating and sometimes surprising read. The bookstands as a multi-voiced tribute to the diverse artists who have shaped the National's evolving story, and a testament to what Rosenthal calls the "moments of crisis, inspiration or jubilation when only writing will do" (p. xiii).